Court placing itself above the community? 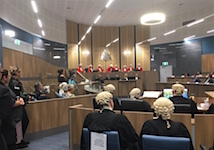 “Any such impression would be entirely mistaken,” said Chief Justice Michael Grant, presiding over the ceremonial sitting of the Supreme Court that inaugurated its new Alice Springs facilities today. KIERAN FINNANE reports.